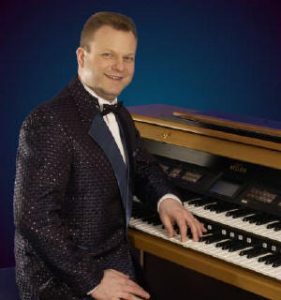 Andrew Nix was born in 1968 just outside Selby, North Yorkshire, has established himself on the organ circuit not only as a musician but also as an entertainer. His varied musical repertoire, along with his Yorkshire humour, has made him one of the country’s favorite performers. It was when Andrew reached the age of ten that his interest in organs became apparent. His mother had an organ at home and Andrew sat down and learnt several Christmas carols (even though it was in the middle of summer). His parents saw the potential and arranged lessons for him. Although he was taught by two teachers (one being classical) he soon developed his own style. Shortly after leaving school Andrew was offered three nights a week playing in a local club where he accompanied artists and played for dancing. This training proved to be priceless as, at 17 years old, he was appointed Organist and Musical Director for a theatre group performing at Butlins, Barry Island. Andrew thoroughly enjoyed this position as he was gaining experience and confidence. After three further seasons with Butlins and one for Haven Holidays Andrew became fully freelance as he was increasingly in demand for concerts and dances nation-wide on both theatre and electronic organs.